The Tories and their Lib Dem allies want to make workers pay for the crisis caused by the bankers and the bosses. Our money is funding their profits and their bonuses, and we are being expected to work longer and pay more for less. A cut in pensions is a cut in our wages. We all have the right to a decent retirement. Recent "concessions" from the government have been derisory. We need to take action, and on November 30th we have that opportunity. 2-3 million workers from 29 unions are set to strike, more than at any time since the General Strike of 1926. This is a fight that we cannot afford to lose. Not just for pensions, but to stop the Tory attacks on our services and our jobs. Come along and help build and organise the fight back. Last Friday, the Occupy! movement came to Leeds. There are currently eight tents pitched beneath the tree in City Square, aiming to create a forum for public debate, and to throw light on a political system that is undemocratic, unjust and unsustainable. Please come along and get involved. 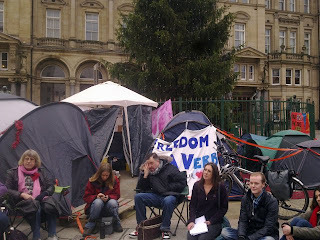 General meetings are held each day at 2pm and 6pm, and you can find out what's going on and what's needed via @Occupy_Leeds on Twitter, and the Occupy Leeds group on Facebook. 1.This Monday there is an organising meeting, called by the UCU region and supported by Leeds Against the Cuts, to build for a successful day of strikes and protests on November 30. In particular, the group is organising to build for a demonstration of strikers, students and supporters from Woodhouse Moor to the central rally in Leeds Victoria Square called by the regional TUC on the day. In addition we have produced a leaflet to build up for the day, so help us get it out to hospitals, schools, and council workplaces, along with the campuses and the community, to build support for the strike and solidarity from those who aren;t on strike. Thirty or so trade unionists have been meeting from various unions, including the main striking ones, to organise for the day, so come along and get stuck in! meet at the cafe in Leslie Silver building, Leeds Met, 5.30 pm - we go and find a room. 2. Public meeting organising for N30: Wednesday 23rd November at 7.30 pm, Civic Hall, Millenium Square. Speakers from several unions, plenty to time to discuss how to make 30 November as big and successful as possible. Poster attached, you can pick up leaflets at Unison offices on Woodhouse Lane (the church) or get in touch for a file, to print out and give to your fellow workers, students or neighbours. Sparks rank & file meeting - ALL ELectricians, Plumbers and Fitters should attend. All other construction workers and trade unionists are welcome. There are Rank and File committees in the North East, North West and London. There are also protest movements in Humberside, Nottingham, Glasgow and Edinburgh. Where has Yorkshire been? We know there are thousands of you out there. This effects you lot as much as it does us. Get involved and get to this meeting. Invite all the sparks, fitters and plumbers to this event and group. We will be demonstrating on the 30th of November in support of the strikes, and in defence of Public Sector Pensions. Assemble at 10.30 a.m. on Woodhouse Moor, opposite the Library pub. We will be marching down to Victoria Gardens on the Headrow to join a rally organised by the Regional TUC at 12 noon. Bring placards, whistles, flags and most importantly yourselves. Let's let Cameron and Osborne know how we feel about the proposals to make us work longer for less. We will be leafleting to raise awareness of the pensions issue, and build solidarity with the action on November 30th. Everyone is welcome to lend a hand. We will also be distributing literature from the unions taking, or balloting for, strike action on the 30th. If you have additional material from your own union, please feel free to bring it along.